Thank you for visiting our web site. We specialize in tablecloths and accessories from Provence in France and other Mediterranean areas including Spain and Italy. We have had a home in Provence for over 20 years and are very familiar with their products. We hope that we can provide you with that extra service for your shopping experience. These ladies know their stuff !! We have now returned from France and are looking forward to the summer. We are open most days in the week. Please call:: Judith's cell 315 263 7893 or Eileen's cell 315 727 4923. Also you can phone the shop 315 655 1095, or email juleens@lavenderblue.bz. Many thanks. We hope to see you soon. Our best sellers are the coated cotton tablecloths including acrylic coated printed cotton and Teflon-treated Jacquards. These are the famous "French Resistance". Care-free maintenace as spills are just wiped away. No real need to machine wash.
We are located on the main street in Cazenovia, kitty corner to the Lincklaen House. The historic village of Cazenovia is located 20 miles SE of Syracuse on Route 20, the old route from Albany across the Fingers Lakes. 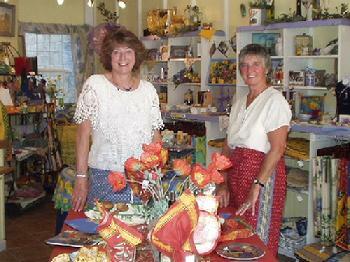 To learn more about the village visit www.villageofcazenovia.com. For purchases over $170 we will mail to you FREE in the US. All our mailings are from the US so there is no duty to pay. For purchases less than $170 add 10% for shipping and handling (a minimum of $8.00 for eastern and central states: minimum of $13.45 for western states). We use USPS Priority or UPS. For rush orders we will quote you a shipping cost. New York State residents please include 8% sales tax. We do take PayPal. We are on You Tube. Visit us at Lavenderbluecazenovia France and see the Ladies in action !! Our range of tablecloths include polyester, cotton, acrylic-coated cotton, teflon-treated Jacquard, linen/cotton blends, organzas, and PVC tablecloths (oilcloth). Provencal coated cotton. The acrylic and teflon-treated tablecloths are very popular as they are extremely low maintenance. They are the latest craze in Europe. Cotton and acrylic-coated cotton are available as 70" round and (typically) 62"X98" rectangles. We also have new linear designs that can be custom cut to any length. Jacquard polyester are available in square 60"x60", 70"x70" and in rectangle 60" wide and of lengths 78", 98" and 118"
Jacquard teflon-treated cotton are available in square 62"x62" and rectangles 62" wide and of lengths 78", 83", 98", 102", 118",122" and 138". Not all sizes are available in all patterns. We have 'luxe' Damask, Jacquard and Matelasse tablecloths in a variety of sizes and shapes including runners, 'tet a tet', table toppers. Italian and Turkish oilcloth with circular designs are 60" in diameter, and the 'allover' patterns are 60" or 55" wide which can be cut to any linear. The 'allover' patterns can also be cut circular 55" diameter or oval. Umbrella holes can be added if needed. The Turkish oilcloth is also available by the 20 meter roll at wholesale prices. Please call. We now have the largest selection of Mediterranean oilcloths in the US. As accessories we have many varieties of napkins, placemats, runners, aprons, kitchen towels, hand towels, ovenmits, breadbaskets, as well as complementary ceramics and dishes (French and Spanish). We have a new range of Terrytowel hand towels from Coton Blanc suitable for both the kitchen and the bathroom. We would love for you to visit our shop where you can experience the wide range of bright Mediterranean colors and their many designs. Our products make such wonderful gifts for your friends, as well as self indulgences. We also have a bridal registry and can arrange host parties at your home. Please phone if you have any questions regarding our products.